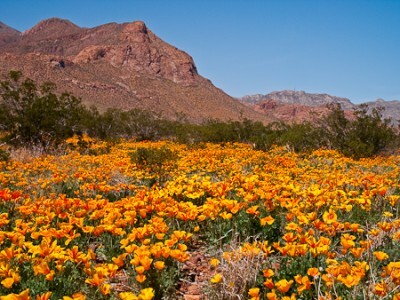 Here in Arizona, our hot summers, warm winters and overall arid climate make for some pretty tough growing conditions. 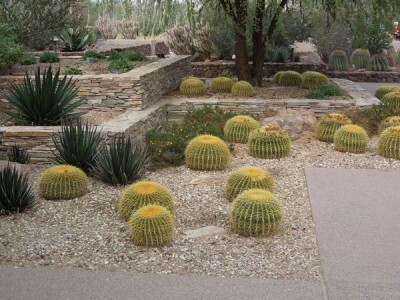 Is your desert yard in need of a makeover? The pros at Earthtones Landscape Management can help! With a little planning, dedication and regular maintenance, that dry, unkempt yard can be turned into a beautiful outdoor paradise for you and your family to enjoy year all year long. 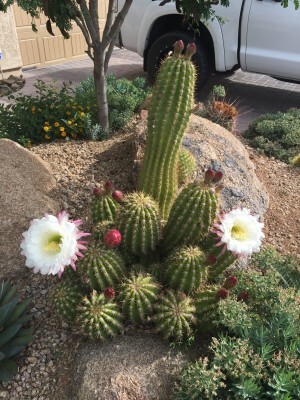 Make A Plan: This is perhaps the most difficult part of the 5-step process to give your desert yard a great makeover, but it’s obviously critical to the success of the project. The first question you need to ask yourself is, “How much am I willing to do and what kind of yard do I want to have?” If you’re the type of person who doesn’t like to handle landscaping maintenance on a regular basis, you may want to consider contacting us so we can help you choose an installation that won’t require daily/weekly maintenance, or give you options on our regular landscaping maintenance services. If you’re not interested in doing regular maintenance yourself or hiring the work to be done, consider installing hardscape elements to fill up empty yard space as opposed to installing grass and other plant life. Besides regular weeding, installing rock beds or stone hardscape areas are a great way to avoid the routine hassle of weekly maintenance. Decide where you want your beds and hardscape areas, and then choose where you’d like to have a lawn. Clean it Up: Now that you’ve decided what you want to do, start to make it happen. Contact Earthtones for a one-time yard clean up or begin to prepare your space for grass and hardscape installation. No matter which way you choose to go, you’ll want to rake out the yard, removing any debris, rocks, roots, errant branches and other vegetation. After that, you’ll want to grade the area to ensure proper runoff. You’ll want to grade from your house on down, meaning that the grade will decline as you move away from your home to prevent water from running back toward it. While you are grading or raking out your yard, keep an eye out for scorpion nests, snake burrows, and other stinging insects, and always wear thick, protective gloves and boots. Install Hardscape, Beds & Lawn: If your plan is to grow a lawn, you’ve picked an excellent time of year to undertake this project, as fall is the best time to install grass, thanks to the rains and milder temps brought on by monsoon season. As to the type of grass to install, just keep in mind that Bermuda grass is great for summer due to its hearty, resilient nature, and Rye is excellent during winter and early spring months. Till and pre-treat the area with fertilizer and you’re off to the races. Let hardscape areas and beds provide the “filler” around your home and out into the yard. Installing beds close to the house further reduces the chances of water intrusion thanks to rocks and bed liners that slow the passage of water into the ground, as well plant root systems. When it comes to hardscape, ask yourself, “What do I enjoy doing outside?” Do you enjoy eating outside or grilling out? Consider installing a stone patio out back with a custom-built stone grille station. Do you like to relax in nature? Consider installing a stone fire pit area or fountain for quiet days and evenings of peaceful contemplation. This is Arizona, so you’ll want to consider shading your outdoor livable spaces with trees or custom awnings in order to stay cool. The possibilities for your yard are nearly endless and should revolve around the way you want to use your space. Add Traditional Landscaping Elements and Irrigation: This time of year is perfect for planting a wide variety of trees, bushes and other foliage, thanks to cooler temperatures and more frequent rains. African daisies, Alyssum and Carnations are all good flowers to plant during the fall, while trees like the Palo Verde, Ironwood, Sissoo and Desert Willow will thrive with proper installation and bi-annual care. Consider adding some landscape lighting to highlight beds and hardscape areas to create contrast and focal points. Lastly, irrigation may be necessary to keep your flora at its best. There are several options, from small bed irrigation systems to whole yard systems that cover everything. Before you install hardscape or grass, make sure to discuss an irrigation system with your landscaping professional. Utilize the Space You’ve Created: Once it’s done, get out there and enjoy it! If you get started on your desert yard makeover now, you’ll be able to enjoy your space just as the weather begins to cool down. For more information or to schedule a no-obligation, no-hassle consultation, contact Earthtones Landscape Management today. The heat has arrived in Phoenix and across the Valley, but that’s no reason to throw in the towel on your landscaping this summer! Earthtones Landscape Management has a few great ideas for your yard during these warm months: from creating shaded spaces to customized hardscape, there’s plenty to do and lots of different ways to make your property its best during Arizona’s sizzling summer. There’s nothing more frustrating than dealing with dying, yellow grass or wilting leaves, and nothing more costly! If you’ve had problems maintaining your lawn in the past, consider an irrigation system. A series of above and below ground water lines ensures that your lawn stays green and your trees, shrubs, bushes and flowers get the daily water they need. For more information, including maintenance costs and more, contact Earthtones Landscape Management. No one wants to sit out on their patio or somewhere in their yard without shade: it’s just too hot. Creating a shaded space to beat the heat can be as simple as installing an umbrella or awning, but where’s the fun (or beauty) in that? Build your own shaded spot by having Earthtones install mature trees like an Indian Laurel or Chinese Elm. Both types of tree have a wide, thick range of cover and grow quite quickly, providing great shade and a wonderful spot to cool off. While you’re busy planting shade trees, consider improving upon your shaded spaces by adding a bench, fire pit or other “hardscaping.” Some neat ideas include patios with built-in stone countertops and a grill, stone walkways/pathways, fountains, backyard bar installations and so much more. And don’t forget, hardscaping isn’t just for the backyard! Concrete or stone pathways out front make for great curb appeal and can add to your home’s overall value as well. While yard maintenance isn’t necessarily a landscaping idea, good maintenance ensures a long life for your property’s landscaping, so don’t skimp on regular care. If you need help maintaining your yard, take a look at some of the different services offered by Earthtones Landscape Management. While the heat may be oppressive this summer, your yard doesn’t have to be! Beat the heat with some great landscaping and make this year the year your property gets the facelift it deserves! For lawn lovers everywhere, the start of spring is a magical moment! When it comes to Phoenix area lawns, the pros know it’s time to start caring for your dormant Bermuda grass, fertilize your fruit, evergreen and deciduous trees, and plant those summer flowers in order to get the most out of your yard. But where to begin, and what to do? Have no fear, the professional Phoenix landscapers from Earthtones Landscape Management are here to lead you through the process step by step. Clean up Your Landscaping: The first step to a healthy spring yard is getting it clean and orderly. Many of us neglect keeping up with landscaping during the winter months, so now’s a great time to clean up your yard. Clear broken tree limbs, trim bushes and other foliage, mow your lawn and fix anything that may have broken during these cooler months. Spring is also a great time to begin weeding any flower beds or other areas with foliage or groundcover. April and May tend to be the worst months for weeds as new, unwanted growth gets its first chance at life. Prepare Your Grass is You’ve Got It: As you may know, many lawns in Phoenix require two types of grass to thrive year-round: Rye and Bermuda. Not so hearty yet resilient to cooler temperatures, Rye makes the perfect winter grass, but doesn’t thrive in hot weather. As spring temperatures increase Rye will begin to wither and fade. Bermuda grass, on the other hand, grows quite well in hot temperatures and is the perfect choice for a spring/summer yard. If your lawn is already seeded, encourage activity with monthly feedings of a nitrogen/phosphorus/potassium-rich fertilizer and inspire a strong root system with frequent deep root penetration watering. If you don’t have Bermuda grass in place, contact Earthtones Landscape Management to see how we can help. Fertilize Some Trees and Plant Now: After you’ve cleaned up your property and started prepping the Bermuda grass, it’s time to fertilize fruit, evergreen and deciduous trees, and plant certain flowers and groundcover plants like Floss Flowers, Sweet Alyssum, Dahlia, Scarlet Sage and more. When it comes to fruit trees, citrus tend to be the favorite in Arizona thanks to their relatively resilient nature. Purchase a fertilizer specifically for fruit trees and read our post on citrus fertilization to ensure you’re applying the correct amounts. It’s also worth mentioning that if you haven’t planted a citrus yet, now’s a good time to do it! Many area residents also love the beauty of evergreen and deciduous trees, and spring is the perfect time to fertilize them. A healthy application of Fertilome Tree & Shrub Food around the base of the tree will usually do the trick, and you can apply at the rate of one cup per inch of tree trunk diameter. After application, water the fertilized tree – it’s as simple as that! These are just a few tips for prepping your lawn and caring for it during spring! If you have any questions or need more information, contact Earthtones Landscape Management today. Unlike most of the country, Arizona has wonderfully mild winters, and although this year has had its cold spots, we’re still better off than those poor saps out on the east coast! Considering we have this nice weather, let’s take advantage of it by learning 5 important ways to maintain your winter landscaping and prepare for the coming spring season. Start Thinking About Lawn Care: Many Phoenix residents love to have a lush lawn all year, and if you’re one of those people, it’s time to start thinking about caring for your Bermuda grass. As the winter Rye grass starts to die out as temperatures heat up in late March/early April, the dormant Bermuda grass will start to become active, and you’ll want to encourage this activity with monthly feedings of a nitrogen/phosphorus/potassium-rich fertilizer. Bermuda grass also requires deep root penetration watering, so get those sprinklers ready. If you have an irrigation system, now would be a good time to have it checked by Earthtones Landscape Management to ensure proper functionality. Plants to Sow: There are plenty of great plants to sow right now, and the end of January and early February are great times to plant summer bulbs, get started on weed prevention with a pre-emergence herbicide, and after the frosts end in mid-February, begin with some fertilization. Some great plants to sow include the African Daisy, a bright, beautiful flower that requires full sun exposure and little water. Carnations are another nice addition. These gorgeous perennials require full sun exposure and regular watering. For an attractive groundcover plant with lovely flowers, consider the Globe Amaranth. This plant is fairly heat tolerant and can stand full sun exposure, but some light shade won’t be a problem, either. It grows to be about 6 inches in height and anywhere from 6-12 inches wide. Occasionally water and you’ll have beautiful winter groundcover with a splash of color. Tree Pruning: February is a great time to have Earthtones Landscape Management prune your deciduous trees. If you happen to own a Mexican Ebony Tree, Canyon Hackberry, Desert Willow, Texas Honey Mesquite, or any other type of deciduous tree, now is the time to prune for a healthy spring and summer growing season. Be sure to check out our recent blog post for more information about why tree trimming and pruning are so important for the life and health of your trees. By following the previous link you’ll learn all about crown reduction, thinning and lifting, and so much more. Keep an Eye on Freeze Warnings: The last thing anyone wants is for their plants to die due to an unexpected freeze. 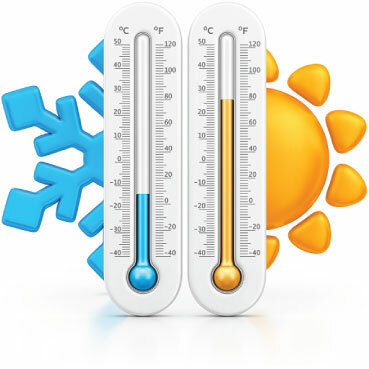 In Phoenix (and Arizona in general) temps can drop below freezing well through February, so it’s important to protect you investment. Find out which plants and trees on your property are susceptible to freezes (contact Earthtones Landscape Management to get help with this if you don’t know what type of plants and trees you have) and get them covered. Do not use plastic, as this traps moisture and can damage the plant. Instead, simply use a cotton sheet or burlap sack cloth and make sure the plant is covered all the way to the ground to lock in heat and keep out the frost. Clean up Your Landscaping: Many of us neglect keeping up with landscaping during the winter months, so now’s a great time to clean up your yard. Clear broken tree limbs, trim bushes and other foliage, mow your lawn and fix anything that may have broken during these cooler months. Keeping a clean property ensures that your home’s value remains intact. As an added bonus, it makes those winter cookouts and get togethers even more enjoyable. There you have it: 5 great Phoenix winter landscaping tips to keep your yard healthy and beautiful. If you have any questions or need more information, contact Earthtones Landscape Management today! Fertilizing your citrus and palm trees is key to maintaining their fruit, yield and natural beauty. Arizona’s climate is well suited to growing all manner of citrus, including navel oranges, grapefruit, lemons and tangerines. These trees can be planted year round, but do best when planted during March or April, or even during the month of October. Palm trees, on the other hand, do best when planted during the warmer months of April through September. Everyone loves a great looking citrus or palm tree; they provide shelter, in some cases produce fruit, and provide an aesthetically pleasing addition to any yard when they are properly trimmed and maintained. But what’s the best way to care for these trees and make them look their best? The answer is simple: fertilization. Fertilizing citrus trees in the Phoenix area doesn’t have to be an arduous task, but you do need to be careful to avoid over fertilization, which may lead to less juicy, tougher fruit and peels. Click here to contact Earthtones about a citrus fertilization schedule. To begin, it’s best to choose a fertilizer that is specifically designed for fruit or citrus trees. You’ll see this information listed on the bag. Additionally, you want to pick a fertilizer that contains phosphorous and nitrogen, which are two critical elements for proper citrus tree health and growth. When it comes to choosing how much fertilizer to use and how often to use it, follow the instructions on the bag, but remember a few rules of thumb: For smaller or younger trees (2-3 years old), use about a half pound of fertilizer three times a year (late January, late April and early August). For larger citrus six-years-old and older, use about two and a half pounds total three times a year. For newly planted citrus trees (0-1 year old) use about a quarter pound three times a year if needed. This is a good guide for fertilizing citrus plants like oranges, limes, lemons, etc. For grapefruit, split all of the aforementioned measurements in half. After you’ve measured your fertilizer out, throw on some protective gloves and spread the fertilizer evenly about three to four feet around the tree’s trunk. After spreading, grab a rake or similar tool and lightly aerate the area so the fertilizer easily absorbs into the soil. Lastly, water the tree according to the directions on the bag. While some palm trees are different than others, most require frequent watering but infrequent fertilization. Arizona soil is typically deficient in nitrogen, and most palms suffer from some sort of magnesium and potassium deficiency, so finding a palm tree fertilizer rich in all three elements is important. You can typically find special palm tree fertilizer on sale at local stores or available online. To talk to a specialist contact Earthtones about palm tree fertilization by filling out our online form. You’ll typically apply palm tree fertilizer twice a year (once in mid-spring and once in early summer) for best results, but again, be sure to follow the instructions given on the bottle. Spread the product evenly around the base of the tree but avoid the area around the trunk and water thoroughly afterward. If you notice that your palm tree looks a little worse for wear (brown, drooping fronds, dead fronds, etc.) and under-watering isn’t the problem, additional fertilization may be needed. If you follow these simple steps for citrus and palm tree fertilization you’ll enjoy beautiful, bountiful trees all year round. And if you’d like to have Earthtones handle your yard’s tree fertilization needs don’t hesitate to contact us or call the number to the right for a free, no-obligation quote! We all love enjoying the outdoors during the cooler fall months in the Phoenix metro area, and one way to ensure beautiful surroundings at your home or business is to understand the importance of proper tree trimming and crown maintenance (otherwise known as tree pruning). The tips below will apply to popular desert trees in Arizona like the Museum Palo Verde, Sissoo Tree, Blue Palo Verde, Willow Acacia, Ironwood, Vitex and many more. What is a Tree’s Crown? Simply put, a tree’s crown is its leaf and branch area. This area does not include the trunk of the tree, just all of the visible branches and leaves/blooms. Crown reduction is a type of tree trimming or pruning that reduces the overall size of a tree’s crown. Think of it like a haircut for your tree – it reduces the total volume of branch and leaf content and helps shape the tree’s vegetative growth. In practical terms, a crown reduction may be necessary if you feel like you need better visibility to what lies beyond the tree, if you need to let more light enter a particular area of your yard, or simply want to improve the look or appearance of your tree. Crown thinning is a procedure which involves removing carefully selected branches within the tree’s crown in order to give other branches room to grow. Thinning also removes “tree clutter” or debris like dying branches to ensure healthy growth. This type of tree trimming is especially important for Phoenix-area residents if dead or diseased branches are becoming a problem or potential hazard. Crown lifting is the process that allows lower branches of a tree to be removed in order to alter its appearance, allow for extra clearance under the tree, or as a mechanism to allow extra light to enter a particular area of your yard. It’s so named because removing the lower branches appears to give the tree’s overall crown a “lift”. Now that we’ve defined a few key terms and described various types of crown maintenance we can talk about the overall importance of tree trimming in Arizona. Firstly, proper tree trimming/crown maintenance/pruning is important to maintaining a safe environment for your family or business. No one wants an accident due to an overburdened tree or dead branches falling and hurting someone or damaging other parts of a home, business or yard. IF you’ve already been affected by falling debris, schedule a one-time yard cleanup from Earthtones Landscape Management. While maintaining a safe environment for your family or business is important, so is maintaining the health of your tree! A tree that receives regular trimming and maintenance will grow to its fullest potential and have the healthiest blooms/flowers/leaves possible. Removing dead branches promotes growth and looks aesthetically pleasing as well. It’s also important to note that an improperly trimmed or pruned tree can not only be unattractive, but dangerous as well. 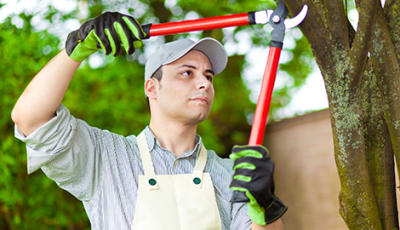 Without an experienced hand, improper pruning can lead to diseased branches, loose branches, etc., which could potentially cause irreparable damage to the tree and a situation where someone might be hit by a falling branch. Learn more about a regular yard clean-up and maintenance schedule or simply contact Earthtones Landscape Management for more information. Last, but certainly not least, tree trimming also helps ensure that a property’s value remains as high as possible. After all, it’s more than just a home that determines value. Keeping your landscape’s trees in tip-top shape helps keep your property values high. Remember, a properly trimmed tree is a happy tree! Be sure to stay tuned to our blog for even more helpful articles on how to properly maintain your yard and get the most out of your landscaping. You may have heard the term deep drip or deep watering before. Well, that’s because it works! 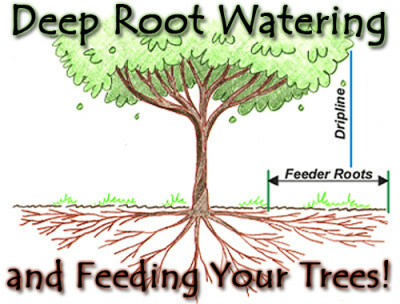 “Deep Watering” tree’s promotes deep rooting of trees and shrubs. This allows them to be more prone to surviving drought, and giving you thriving foliage and flowers. Deep watering allows you to water your plants less often, but simply for a longer period of time. For example, instead of watering daily which will keep your plants alive, deep watering is only required once every three days or so for a longer period of time seeing as the water penetrates the surface to get the the “root” of the problem. Water saturates the area allowing for the plant to have more continuous supply, rather than surface water evaporating quickly in the Arizona heat. Give us a call for more details or to set up deep watering for your beautiful landscape!